(Nanowerk Spotlight) Vaccination is one of the most effective ways to prevent microbial infection. International vaccination campaigns have played a pivotal role in the eradication of small pox and the imminent eradication of polio. Yet, formulating effective vaccines is more of an art than an exact science. Several widespread and devastating diseases including malaria and HIV are proving difficult to develop vaccines against. Traditionally, vaccines were formulated using attenuated or inactivated versions of the microbes they were intended to treat. However, inactivated microbes do not often elicit a strong enough immune response to induce antibody production. Attenuated viruses, on the other hand, may revert back to an active form within the body. There are also inherent difficulties in ensuring batch-to-batch consistency of the formulations. These shortcomings have led to a progressive shift towards the development of synthetic vaccines. Synthetic vaccines can combine a portion of the target microbe, known as an ‘antigen’ together with an adjuvant that stimulates the immune system. They are more reproducible and have the potential to induce consistent and tailored immune responses. Yet, delivering both the adjuvant and antigen together to the appropriate immune cells is challenging. The emerging field of DNA nanotechnology may provide a solution. On top of acting as a scaffold to co-deliver antigen and adjuvant, DNA nanostructures allow precise modification of the structure and presentation of these components. The design freedom of DNA nanostructures allows a vaccine developer to tailor the interaction of the nanostructure with both the targeted immune cell populations and off-target cells, creating a selective response. Reporting in the the July 3, 2012 online edition of Nano Letters ("A DNA Nanostructure Platform for Directed Assembly of Synthetic Vaccines"), a team of researchers based at Arizona State University and headed by Yung Chang, PhD and Hao Yan, PhD demonstrated that DNA nanostructures with appended adjuvants could elicit antibody production against a model antigen in mice. Until now, the potential of DNA nanostructures to act as vaccines has only been demonstrated in vitro. They then affixed multiple copies of the protein streptavidin to act as a model antigen. 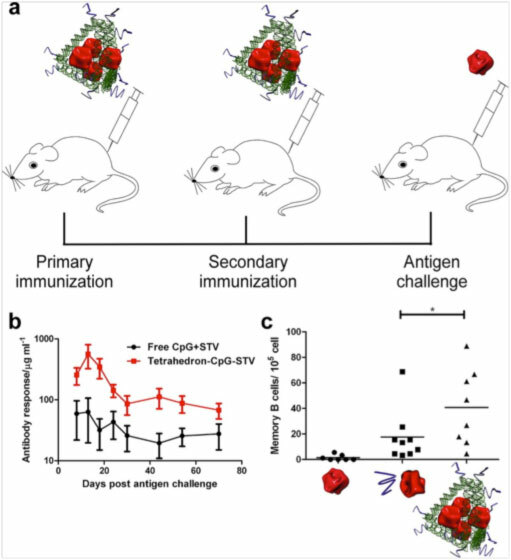 When they injected the constructs into mice, they found that the mice produced far more antibodies against streptavidin than when streptavidin and the CpG sequences were administered without the construct. In addition, a larger fraction of the mice produced antibodies. The results showed that the assembly of antigen and adjuvant on the DNA nanostructure has a synergistic effect on the immune response. Since DNA tetrahedrons are made out of interconnected chains of double-stranded DNA, it is possible that the nanostructures themselves will elicit an autoimmune response against healthy cells in the body. The model antigen, streptavidin was chosen to illustrate that vaccines made from DNA nanostructures could be used in live animals. Moving forward, the researchers intend to substitute streptavidin for antigens that are relevant to actual diseases. “With the modularity of the DNA nanostructures, we can explore so many different antigens and adjuvants – the possibilities are endless” says Chang. The researchers also believe that further refinement of the size and structure of the DNA tetrahedron will allow them to elicit more potent and selective immune responses. To gain even more design freedom, the DNA tetrahedrons can be substituted for DNA ‘origami’. DNA origami are formed by folding long sequences of DNA into programmable shapes using a series of short ‘staple’ strands. The authors credit the success of the study to a strong multidisciplinary collaboration that brought together Dr. Chang, an immunologist, and Dr. Yan, a chemist. Although the results from this study are encouraging, they represent only a step towards the ultimate goal of making DNA nanostructure-based vaccines a clinical reality. There are still many challenges. “A big challenge from an immunological point of view is the stability of the particles” explains Chang. The body is equipped with an array of ‘nucleases’ – enzymes designed to degrade extracellular DNA. Nucleases may degrade the nanostructures before they reach their target." The researchers believe that the simplicity, robustness, and relative economy of the DNA nanostructures will be key advantages driving further development. Ultimately, the demonstration of the in vivo applicability of DNA nanostructure-based vaccines represents an important step towards the eventual application of these constructs in humans. Moving forward, it will be interesting to see whether the technology can be adapted to treat animal models of disease. Beyond that, navigating the regulatory framework will be a significant long-term challenge.